There are an array of opinions out there about the new bill signed into law by President Obama, the Family Smoking Prevention and Tobacco Control Act, but the aim of the law seems clear - to prevent kids and young adults from taking up smoking. FDA officials have provided a number of interesting facts about youth drug use in relation to this bill that may have parents wondering if they should pick up a nicotine test for their children. According to Lawrence Deyton, director of the FDA's Center for Tobacco, “Children are three times as likely as adults to smoke a flavored cigarette.” That is why the new law bans the sale of candy, fruit, or clove flavored cigarettes. While this is a positive step, there are still other facts that may give pause to a parent and possibly interest them in nicotine testing - according to the American Lung Association, every day approx. 3,600 children between 12 and 17 years old try smoking for the first time, and approximately 1,100 of them will become regular smokers. Though the new law will help rectify this situation, some may want to determine tobacco use by using a nicotine test. 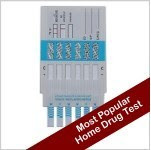 Such a drug test works by determining the levels of cotinine in a urine sample. Cotinine is produced when nicotine enters the body. The nicotine test can tell you if the person supplying the sample has chewed or smoked tobacco in the past 2 to 4 days. The test is confidential and accurate. The scientific principles are the same as other urine drug tests offered by Home Health Testing. For someone worried about tobacco use and addiction, a home drug test can help you learn whether someone is beginning a habit they may regret. It only takes five minutes and provides extremely accurate results. You can purchase this product at Home Health Testing.